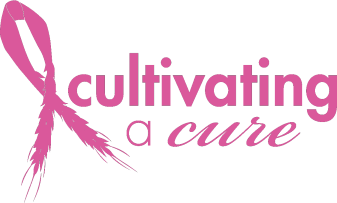 We're proud to announce that this year’s Cultivating a Cure event raised a record $100,000! That means that over the past eight years, Cultivating a Cure has raised more than $530,000. The funds support cancer treatment and prevention research at The Comprehensive Cancer Center-Arthur G. James Cancer Hospital and Richard J. Solove Research Institute, and cancer-related food and nutrition research in the College of Food, Agricultural, and Environmental Sciences at the Ohio State University. Nationwide board member and former Ohio Farm Bureau President Brent Porteus started the annual fundraiser as a way to remember his wife, Debbie, after she died from breast cancer. A special thank you to Ohio Farm Bureau President Frank Burkett III for hosting the Aug. 19 event at his Clardale Farms in Canal Fulton. The crowd was touched by the stories shared by keynote speaker American Farm Bureau Federation President Zippy Duvall (pictured above) about his family's personal experience with cancer. Hitting the $100,000 mark was amazing. We're so thankful for the generosity of those in attendance as well as these sponsors: Nationwide, FLM / Harvest, Stark County Farm Bureau, Farm Credit Mid-America, Clark County Farm Bureau, Heritage Cooperative, Dupont Pioneer, Ag Credit, Hill Supply, Inc., Ohio Corn & Wheat Growers Association, Ohio State CFAES, Ohio Harness Horsemen's Association, United Producers, Inc., Mary Cummins, Garold Keppler, Diane C. Lyons, Arthur Norman, Debbie Porteus (in memory) and John Riddle. We know that it takes a collaborative approach to growing a vibrant food system. That’s why we’re building unique partnerships by investing in local programs committed to addressing Ohio’s agricultural challenges. To date more than $2 million has been granted to projects that focus on agricultural education, environment and economic issues. The Ohio Farm Bureau Foundation is proud to support OSUCCC's innovative approaches to preventing, diagnosing, and treating cancer with the hope that research will lead to a cure in our lifetime. ONE PERSON, ONE DISCOVERY AT A TIME. The OSUCCC—James strives to create a cancer-free world by integrating scientific research with excellence in education and patient-centered care, a strategy that leads to better methods of prevention, detection and treatment. Ohio State is one of only 41 National Cancer Institute (NCI)-designated comprehensive cancer centers and one of only four centers funded by the NCI to conduct both phase I and phase II clinical trials. The NCI has rated Ohio State’s cancer program as “exceptional,” the highest rating given by NCI survey teams. hospitals in the nation as ranked by U.S.News & World Report.